I’m Ed Smith, a Woodland car accident lawyer. I want to keep you updated with changing California laws. On 1 January 2017, a new law came into effect that essentially bans California drivers from holding their phones while driving. This law fills major gaps left by earlier cell phone legislation and may help save lives. 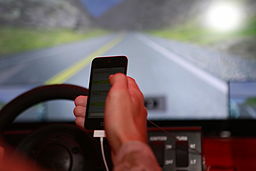 The new law states that drivers can only use their cell phones while driving if it is “hands-free.” The law specifically allows the driver to only touch the phone once using “the motion of a single swipe or tap of the driver’s finger.” The law further specifies that a cell phone can only be mounted in the lower corner of either side of the windshield. For the full text of the law, see https://leginfo.legislature.ca.gov/faces/billNavClient.xhtml?bill_id=201520160AB1785. According to California lawmakers, the law fills a serious gap. Previously, California state law left it legal for people to use social media, take videos, and otherwise operate their cell phones while driving. Many car accidents were therefore still caused by cell phone use while driving and law enforcement was unable to cite those responsible. Lawmakers hope this new law will reduce distracted driving accidents by disallowing most attention-heavy cell phone use while driving. Limiting teenager use of cell phones while driving, however, will likely greatly decrease the number of accidents. A 2015 University of Iowa and AAA Foundation for Traffic Safety study found that teenaged drivers were distracted in 58 percent of car accidents. 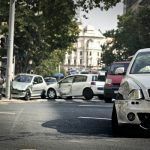 While the new law will hopefully decrease the number of accidents due to distracted driving, accidents will still happen. The most common injuries in these accidents are head and neck injuries caused in low-speed accidents. These injuries are commonly known as cervical sprains (whiplash) and are caused by a vehicle being rear-ended while stopped in traffic. These cervical sprain injuries can then have a serious impact on a victim’s life. Cell phone use on highways or other areas of high speed drastically increase the risk of serious injury, or even death, in a car accident. Severe chest trauma, head trauma, spinal damage, and extremity trauma are known to result from high speed crashes. High speed accidents caused by cell phone use also often result in fatalities. The most dangerous accidents caused by cell phone use while driving are those involving commercial freight trucks. A 2014 Federal Motor Carrier Safety Administration report says that commercial drivers are 23.2 times more likely than regular drivers to get into an accident when using cell phones. Adding the weight of these vehicles, accidents wherein commerical drivers are distracted by cell phones are far more likely to cause fatalities. In cases where an accident is caused by someone using a cell phone, the person on the cell phone is liable for damages as they did not exercise due caution in their operation of a vehicle. The new law may further help prove this liability by making it illegal to be holding a device. I’m Ed Smith, a Woodland car accident lawyer. If you, or a loved one has been severely injured or lost their life in a motor vehicle collision, please call me at (530) 392-9400 for free, friendly advice. Or, dial me toll free at (800) 404-5400. I’ve been helping seriously injured Northern California residents with their personal injury claims and wrongful death actions for more than 33 years. See my reviews on: Yelp, Avvo, and Google. Look at my successful history of Past Verdicts & Settlements. I am also a member of the Million Dollar Advocates Forum. This is an association of top US trial lawyers that have won multiple million dollar verdicts or settlements.